Police have donated £350 to St Michael’s Hospice in St Leonards. 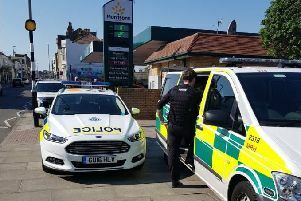 The charity, which was hit by an arson attack in July that destroyed a large part of the building, including the ground floor in-patient unit, has received a £350 donation from Hastings Police. The donation comes from the Police Property Act Fund (PPAF) made up of monies received by the police from property confiscated by order of the courts and then sold. Since the fire the hospice has been closed, with in-patient services temporarily relocated to a local nursing home. Efforts are being made to restore the fire-ravaged building as soon as possible, although the opportunity is being taken to add improvements along the way. These include more en-suite bedrooms, easier access to patient services and a fire-safe lift. The man charged with starting the fire at St Michael’s Hospice earlier this year died in prison last month. Rodney Smith, of Quarry Hill, St Leonards, was accused of arson with intent to endanger life after the fire in July 2015. The 67-year-old was a terminally-ill patient at the hospice at the time of the blaze, which claimed the lives of two other patients.